Vintage Ugly Christmas Sweater Cardigan! 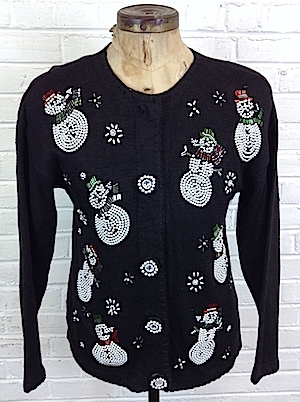 Black knit with fabulously Pearl BEAD snowmen smoking little Silver BEAD pipes, wearing Green and Black BEAD top-hats, while Pearly BEAD Snowflakes fall from the sky! Beads, Beads, Glorious Beads! Five fabulously beaded button fronts. Sleeves and Back are solid. Tagged by Victoria Jones. Ramie/Cotton Has shoulder pads that are easily removable.. Condition: Over all very good except missing the very top button cover seen in the photo and a few loose and missing beads. Does not detract from the awesomeness of this sweater.